If your child simply can't get enough of those little blue Smurfs, you're in luck! The Smurfs High Tea is coming to The Langham, Melbourne in December and January, just in time for school holidays. The Langham, Melbourne is swapping its signature pink for the iconic shade of Smurf blue for over a month, kicking off on Monday 29 December and continuing until Friday 30 January 2015. Smurf blue cupcakes, chocolate-dipped cherry Smurf-berry, Gargamel red boot cookies, village jelly clouds, marshmallow mushroom house, Smurfette chocolate daisy and more. Also Langham's signature, house made fluffy scones with fresh cream and jam will be served with Smurf blue lemonade. Children are encouraged to dress up as their favourite Smurf. 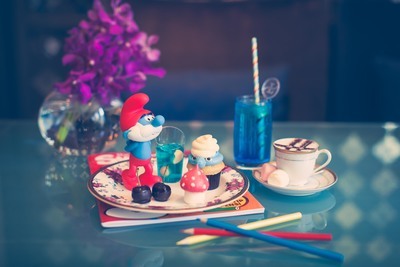 The Smurf High Tea at The Langham, Melbourne will be served Monday through Friday at 10am- 11.30am or 12noon until 1.30pm from Monday 29 December 2014 until Friday 30 January 2015. Children are $35.00 each or $45.00 including a Smurf toy and activity book to take home. Bookings may be made by contacting 1800 641 107 or by visiting www.ariabar.com.au. The Jinx: the Life and Deaths of Robert Durst, have you watched it?